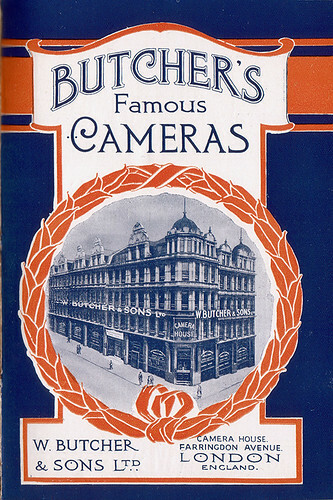 W. Butcher and Sons Ltd. was a British camera maker, formed as a pharmacy business by William Butcher in Blackheath (in south-east London) in 1887. 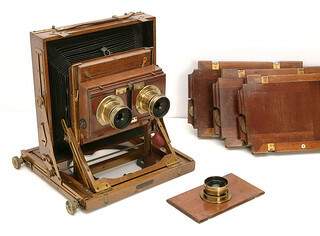 Photographic items were manufactured from c.1897 by sons of William, W.E. & F.E. Butcher. The name "Primus" seems to belong to this early company. By February 1902, the company had a headquarters at Camera House, Farringdon Avenue, London EC (East Central - much closer to the centre of London). Whilst manufacturing some of their own stock, much came from other makers, such as Hüttig and Ica in Germany. In 1914, war prevented Butcher's German imports, and they joined forces with Houghton (very nearby in High Holborn) in 1915 to form the Houghton-Butcher Manufacturing Co. Ltd. The two companies continued to sell their own brands until their full merging on 1 January 1926 to form Houghton Butcher (Great Britain) Ltd., which became Ensign Ltd. in 1930. Little Nipper (c.1900); a rebadged Gnom (1901) or Aviso (1907); the Japanese Cherry is based on these. ↑ Channing and Dunn, pp.29 and 55, McKeown, pp.171 and 393. Channing, Norman and Dunn, Mike. British Camera Makers. An A-Z Guide to Companies and Products. London : Parkland Designs, 1996. ISBN 0-9524630-0-8 Pp.29–30 and 54–5. McKeown, James M. and Joan C. McKeown's Price Guide to Antique and Classic Cameras, 12th Edition, 2005-2006. USA, Centennial Photo Service, 2004. ISBN 0-931838-40-1 (hardcover). ISBN 0-931838-41-X (softcover). Pp.171–3 and 393. This page was last edited on 16 February 2017, at 06:17.